On March 27th, 2019 members of the Royal Canadian Legion Branch #189 Richards Landing and Branch #182 Thessalon presented the North Shore Health Network (NSHN) Foundation with Charitable Foundation Grants for a Pediatric Immobilizer ($5,680 each) at their respective NSHN sites. (Left to right) John Fogal (NSHNF Director); Sue Barlow (NSHNF Vice Chair); Sandra Stevens (President – Ladies Auxiliary); Hugh Hamilton (Charitable Foundation Chairperson); Anne Allaire (Branch President). (Left to right) John Fogal (NSHNF Director); Ed Ray (2nd Vice); Sue Barlow (NSHNF Vice Chair); Murray Bonany (1st Vice); Francine Grasley (Charitable Foundation/Membership Chairperson); David Grasley (Sergeant-at-arms); Gérard Marion (Member); Norm Nash (President); Anita Mitchell (Executive Committee); Jean Rosenberg (Executive Committee); Thelma Nash (Honors & Awards). On Saturday, January 12th, 2019 the Elks of Canada - Echo Bay Lodge No. 535 presented the NSHN Foundation with a generous donation of $1,200. This donation will fully-fund the purchase of a new examination table for the NSHN Richards Landing - Matthews site. Myles Reid (Echo Bay Lodge - Exalted Ruler) presents Donna Orlando (NSHN Foundation - Chair) with donation of $1,200 for an examination table at the NSHN Richards Landing - Matthews site. Grant Application Approved: The Royal Canadian Legion has approved grants for 3 new Pediatric Immobilizers! On December 11th, 2018 the NSHN Foundation received notice from the Royal Canadian Legion Ontario Provincial Command Branches & Ladies’ Auxiliaries Charitable Foundation that our grant request for a new Pediatric Immobilizer at each of the three NSHN sites was approved. The cost of this equipment is approximately $5,700 each. Many thanks to the Legion for their continued support. Employees of Cameco’s Blind River Refinery Donate Over $28,000! Each year Cameco’s Blind River Refinery Employees rally together to support a local cause through the Cameco Giving Campaign. This year, the NSHN Foundation was pleased to be chosen as the beneficiary to support the purchase of a new Digital X-ray Suite for the NSHN Blind River site. NSHN and the NSHN Foundation presented the need for the new equipment to the Blind River Refinery Employees on October 25th, 2018. NSHN’s CNO, Connie Lee, and the Manager of Diagnostic Imaging, Kim Rouselle, were present along with the Foundation’s Coordinator, Laurie Kendrick, and Foundation Director, Marshall Chow. On November 19th the Blind River Refinery confirmed that their employees are contributing $28,032.26 towards the new equipment! The employees are making this generous donation through payroll deduction. Their contributions will help our local community tremendously! The estimated cost of the Digital X-ray Suite is a minimum of $264,000. The equipment is estimated to be installed in March 2020. Another Successful Smile Cookie Campaign! The NSHN Foundation was pleased to be selected as the beneficiary of the Blind River Tim Hortons 2018 Smile Cookie Campaign. Last year, the Smile Cookie Campaign raised $5,921 towards the purchase of a Cardiac Monitoring System for the NSHN Blind River Site. With your help we surpassed last year’s record! The 2018 Smile Cookie Campaign raised $6,756 towards the purchase of a Digital X-Ray Suite for the NSHN Blind River Site! The Digital X-Ray Suite will be installed in the Blind River Site by March 2020. The estimated cost of the suite is a minimum $260,000. The NSHN Foundation is thankful to Denis and Lynn Lefebvre, owners of both Tim Hortons locations in Blind River. Their staff worked endlessly to bake, decorate, and promote the sale of Smile Cookies. MANY THANKS TO ALL WHO PURCHASED SMILE COOKIES!! Your continued support helps keep our local health care within reach. Many thanks to The North Shore Sentinel, The Basswood Lake Association, and The Sowerby Hall and Heritage Committee for hosting 'Call of the Wild' at the 12 Sided Barn in Sowerby. Residents and visitors along the North Shore gathered to listed to Vernon Bailey's stunning performance of Robert Service Poetry, along with music by John McClenaghan. Rather than purchasing a ticket for this event, attendees made a monetary donation towards the purchase of the new X-Ray Suite. This equipment is estimated to be installed in the NSHN Thessalon Site by March 2019. The estimated cost for this equipment is a minimum $260,000. 'Thank You' to our Donors! Donor Recognition events were held at all three sites of the North Shore Health Network June 23-24, 2018. The NSHN Foundation Board of Directors expressed their gratitude towards individual donors as well as service groups, including the NSHN Auxiliary, the St. Joseph's Island Lions Clubs, the Blind River Rotary Club, and the Blind River Walking Group. The NSHN Foundation Chair, Donna Orlando, provided attendees with an update on equipment purchased to date as well as the organization's upcoming equipment needs. The Foundation has begun fundraising efforts for the new X-Ray Suites, to be installed in the Thessalon Site in March 2019 and the Blind River Site in March 2020. It's because of you that access to high quality local health care is possible. See the difference your donations have made in 2017-18 by reading the NSHN Foundation's Annual Donor Report here. On June 11th, 2018 at the NSHN Auxiliary - Blind River Site Committee's Annual General Meeting, the Foundation was given a donation of $14,000 to go towards the purchase of the new Digital X-Ray Suite at the Blind River Site. It is estimated the Suite will be installed at the Blind River Site in March 2020. As the estimated cost is minimum $260,000 the NSHN Foundation has begun fundraising for this equipment in advance. Many thanks to all Auxiliary members and supporters for their continued efforts! Every dollar raised helps keep local health care within reach. 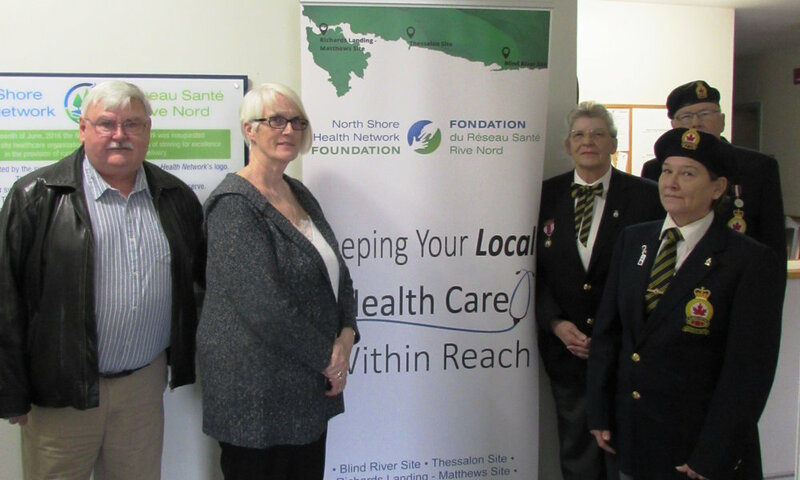 On April 24th, 2018 members from the Royal Canadian Legion Branches in Richards Landing -#374, Bruce Mines - # 211, and Blind River - # 189 presented the North Shore Health Network (NSHN) Foundation Board with grants and donations for medical equipment at the NSHN sites. In 2017, The Royal Canadian Legion, Ontario Provincial Command Branches and Ladies’ Auxiliaries Charitable Foundation approved grants for the following: $8,625.46 for the Richards Landing – Matthews Site for two Blood Pressure Monitors, $9,100.00 for the Thessalon Site for two Intravenous (IV) Pumps and a Laerdal Suction machine, and $8,000 towards a Cardiac Monitoring System for the Blind River Site – Emergency Department. In addition, the Legion Branches in Bruce Mines, Richards Landing, and Blind River donated an additional $1,000 per site from the Legion Poppy Fund to help with the purchase x-ray equipment at each site. The Royal Canadian Legion local branches and Ontario Provincial Command are longtime supporters of local health care and services that benefit veterans and residents alike. The NSHN Foundation and North Shore Health Network Sites are very grateful for the help received from the Legion organizations and the Veterans and Volunteers that support them. Ken Gibson, Director & Donna Orlando, Chair – NSHN Foundation receive a grant of $8,000 toward a Cardiac Monitoring System for the NSHN – Blind River – Emergency Department. The grant was presented by Gloria Spencer and Gerry Green, President – Blind River Legion Branch #189. Richards Landing Branch #374 members, NSHN Richard Landing – Matthews site and patient with Blood Pressure Monitor purchased with grant provided from The Royal Canadian Legion Ontario Command Branches and Ladies’ Auxiliaries Charitable Foundation. 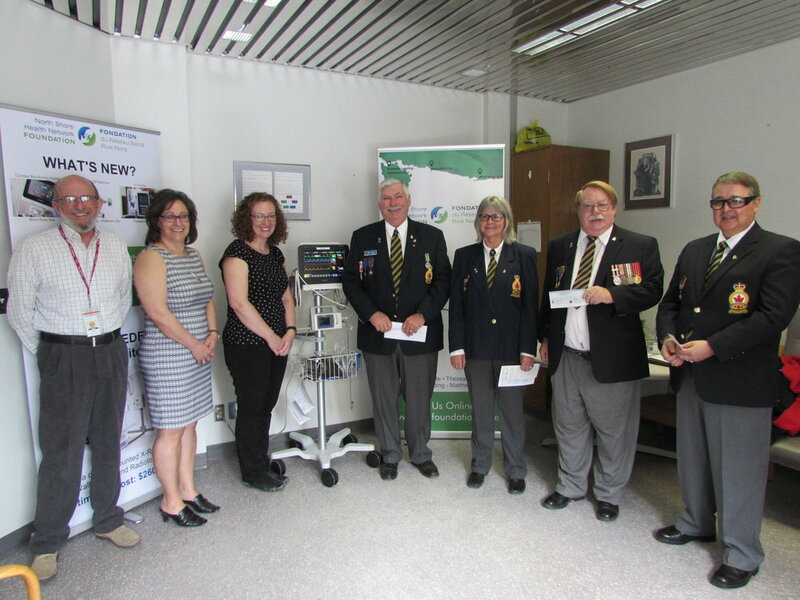 The Ontario Command Branches and Ladies’ Auxiliaries Charitable Foundation approved a grant application from the North Shore Health Network Foundation for the purchase of two Intravenous (IV) Pumps and a Laerdal Suction Unit for the NSHN Thessalon site. On April 12th, members of the Thessalon Legion – Branch 182 gathered at the NSHN - Thessalon site to view the new equipment and present the NSHN Foundation with a cheque for $9,100. The Legion Foundation is funded through poppy tag sales and activities such as break-open tickets, bingos, raffles and local branch operations. Through their strength of their collective efforts, they are able to fund projects which would normally exceed the means of individual Legion Branches. The Thessalon Public School Students’ Council decided to take up a collection at their Christmas Concert to help purchase medical equipment for the NSHN Thessalon Site. A total of $533.05 in donations was collected! These donations will help fund the purchase of a new digital x-ray suite, estimated to cost a minimum of $260,000. The digital x-ray suite will include a ceiling mounted x-ray, x-ray table, wall stand, and radiologist booth. The estimated date of installation is March 2019. The Students are anticipating another collection at the upcoming Spring Musical on April 27th, 2018! Many thanks for their kindness and support. New Digital X-ray is Up & Running at the North Shore Health Network – Richards Landing Matthews Site Thanks to the generosity of donors to the North Shore Health Network – Richards Landing site and the fundraising efforts of the North Shore Health Network (NSHN) Foundation and NSHN Auxiliary - Richards Landing – Matthews Site Committee a new portable digital x-ray machine is now in service. The equipment, valued at $179,700, was fully funded by a contribution of $104,940 from the Richards Landing – Matthew Site Auxiliary committee and $74,760 from the NSHN Foundation. Representatives of the North Shore Health Network (NSHN), the NSHN Foundation, and the NSHN Auxiliary, Richards Landing – Matthews Site Committee had the opportunity to view the new equipment on March 27 th . Connie Lee, NSHN - Chief Nursing Officer expressed gratitude for the digital x-ray as it brings the Richards Landing – Matthews site diagnostic imaging capabilities to current best practices. Kim Rousselle, NSHN – Diagnostic Imaging Manager and Jonathon Vairo, NSHN – X-ray Technologist enthusiastically described the improvements provided by the new portable digital x-ray, as compared to CR (computed radiography) which uses a cassette and digitizer for processing. Improved features include: fast, high quality images, the digital images can be viewed in seconds on the screen instead of minutes due to processing, and lower radiation doses. Images are transferred by Wi-Fi to Radiologists in Sudbury and the digital machine is mobile for transporting to the critically ill/injured patient. The NSHN Richards Landing – Matthews Site is the first of the NSHN sites to receive this updated equipment. Fundraising has begun for digital x-ray machines for the other two NSHN sites in Thessalon and Blind River; the estimated cost for this equipment is a minimum of $260,000 per site. The NSHN Thessalon site is scheduled to receive this upgrade in approximately one year and the NSHN Blind River site in two years. The North Shore Health Network Foundation and the NSHN Auxiliaries appreciate the support received for each site through gifts from individuals, families and businesses, as well as their support of fundraising events. All funds are directed to the site specified by the donors and help fund essential medical equipment and patient services. Medical equipment costs are not covered by the Ministry of Health which is why the NSHN Foundation and the NSHN Auxiliary groups are constantly working to meet ongoing needs in our communities. On February 7th, the North Shore Health Network Foundation, and management and staff of the North Shore Health Network (NSHN) thanked Cameco for their ongoing support of local health care at the Blind River Site. In late 2016, Cameco Corporation and the Blind River Refinery Employees decided to support the purchase of a cardiac monitoring system, valued at $100,000, for the Blind River site Emergency Department through 2017 Cameco Giving Campaign. Approximately 85% of employees made donations through payroll deductions and the company matched these contributions. In total, the Corporation and Employees donated over $53,000 toward the equipment purchase. Over the years Cameco has been a strong supporter of the NSHN – Blind River site; to date over $300,000 has been donated toward hospital equipment and patient services. The approval for these items will allow the Foundation to focus efforts on the upcoming need for X-Ray machines at all three sites. Many thanks goes to the Blind River Tim Horton's for choosing the NSHN Foundation as the recipient of the 2017 Smile Cookie Campaign! Thank you to the staff who baked over 5000 yummy cookies for this great campaign! AND thanks to all who purchased a cookie and supported the NSHN Foundation! The proceeds will support the purchase of a new Cardiac Monitoring System for the Blind River Site's Emergency Department. On Saturday, August 19, 2017 the NSHN Foundation hosted a Yard Sale to help fund a new Cardiac Monitoring System for the Blind River Site's Emergency Department. The NSHN donated used furniture and construction materials (i.e. windows, sinks, counter tops, etc.) and the staff donated household items. Together, we raised $2,400! Many thanks to the Foundation's Board of Directors and friends who volunteered their time, and the community members who supported the cause! On June 26, 2017 the NSHN Auxiliary - Blind River Site presented the NSHN Foundation with a donation of $12,000 towards the purchase of a new Cardiac Monitoring System. The Auxiliary raises funds for the NSHN and works diligently in helping the Foundation reach their goals. The Foundation's 2017 Hockey Break-Away Raffle was a great success, thanks to our supporters and sponsors. Since the organization's re-branding in June 2016, this was the first NSHN Foundation event that benefited all three sites of the North Shore Health Network. Approximately 1300 tickets were sold along the north shore, bringing our net proceeds to nearly $9,000! The Richards Landing - Matthews site, the Thessalon site, and the Blind River site will receive approximately $3,000 each to fund new medical equipment and patient services. Thank you to all who purchased tickets, sold tickets, and sponsored prizes - your efforts keep local health care within reach. Cameco - Blind River Refinery Employees and Cameco Corporation have announced they will contribute $53,000 toward a Cardiac Monitoring System for the Blind River Site - Emergency Department. 83% of employees participated in the 2017 Cameco Giving Campaign, and each contribution was matched by the Corporation. The Cameco - Blind River Refinery employees and Corporation have been long-time supporters of the Foundation. In 2013, they donated over $51,000 toward a new ultrasound for the Blind River Site - Diagnostic Imaging Department. Thank You! Your generosity and continuing support of local health care are inspiring. For the past eight years the Blind River Demolition Derby has provided spectators with a fun-packed show of derby car smash-ups. While encouraging families to join the excitement the BR Demo Derby Association encourages a spectator donation for children 12 years old and under in replace of the standard entrance fee. On June 29, 2016 the Blind River Demo Derby Association provided the NSHN Foundation with the proceeds of the 12 years old & under entrance donations. The funds raised by this event will help us keep health care within reach. A special thanks to all who make this event an evening of family fun! The 2016 Color Dash was another success, taking place on Saturday, June 18 at the Blind River Community Centre. The 5km run encourages everyone to participate - whether you're running, walking or strolling - to promote the health and wellness of our community. The North Shore Health Network Foundation was proud to be selected by the Town of Blind River as the beneficiary for the event. The funds raised by Color Dash will be directed towards the Equipment Fund, as the Blind River site is in need of a Bladder Scanner for the Emergency Department. A special thanks to the Town of Blind River, the 2016 Colour Dash Sponsors, and all participants for helping us keep health care within reach! The NSHN Foundation received a generous donation on June 2nd, 2016 from the Florence Nightingale Home Foundation - Order of the Eastern Star chapter 324 in Elliot Lake. The Order of the Eastern Star is a fraternal organization for men and women with Masonic affiliation. With their $4,000 donation the NSHN Foundation is able to purchase several pieces of equipment. They include a special pressure mattress used to help patients who are in bed for long periods of time; a patient turner needed in long-term care to assist patients who have difficulty standing; a Fetal Doppler to check the heartbeat of a fetus; a Venus Doppler to check blood circulation; and a Pulse Oximeter to check the oxygen saturation level in a person's blood. The NSHN Foundation is honoured to receive a charitable donation from the Order of the Eastern Star for the second time; the first being in 1984 to the St. Joseph's General Hospital.